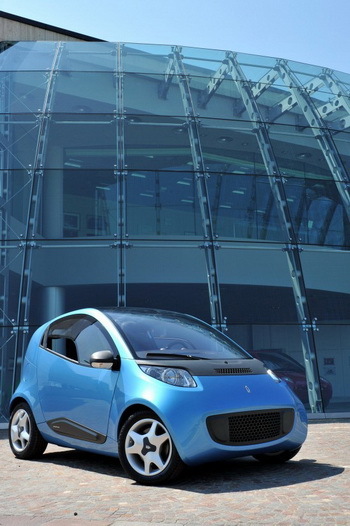 To mark the celebrations of its 80th anniversary in 2010, Pininfarina unveiled the Nido EV, the first running prototype of the "Nido Development Programme", the project for an electric car that was conceived, designed and built entirely in-house. Pininfarina continued to fade away during the first quarter of the year as its balance sheet was, once again, a sea of red ink and there were no positives of any note for the company to report as it continues to try to find a buyer. Shorn of the income from its raft of, albeit loss-making, contract manufacturing operations which appeared in Q1 2010 data, operational income dropped from 57.9 to 13.4 million euros in the first quarter of 2011, the data taken year-on-year for the three month period, with net loss widening from 6.1 to 6.5 million euros. Pininfarina's net financial debt meanwhile increased from 38.2 to 76.9 million euros while shareholder equity slumped from 44.8 to 14.4 million euros. In quarter-on-quarter terms there was very little positive either: income nearly halved (-44.5 percent), EBITDA -1.3 percent), EBIT (+1.5 percent) and net loss (-0.4 percent) were all flat, while the net financial position was down as debt rose (-17.9 percent) and shareholder value (-6.6 percent) continued to deteriorate. Pininfarina is now almost totally reliant on its services sector which includes the styling and engineering operations; its Q1 income amounted to 11.2 million euros, 7.7 percent up year-on-year. Engineering services provided by its German subsidiaries account for most of this increase. The Sectors’ EBIT were negative by 1.9 million euros, with the loss increasing by 0.4 million euros compared with March 31, 2010, when EBIT were negative by 1.5 million euros. Pininfarina explained contributing factors to the worsening of its financial position between Q1 2010 and Q1 2011 as follows: The sharp reduction in value of production is due primarily to the end of the automobile contract manufacturing activities, which were shut down in November 2010 but were still active in the first quarter of 2010. The Service Sector, consisting of the styling and engineering operations, increased its overall business volume, but the loss at the EBIT level was larger than in 2010. Following the cancellation of the joint venture agreements with Volvo Car Corporation regarding Pininfarina Sverige AB, the data for the first quarter of 2011 no longer include the income statement results of this subsidiary, which contributed 1.5 million euros to the consolidated net result at March 31, 2010. The Group’s balance sheet and financial position at March 31, 2011 deteriorated compared with the first quarter of 2010, owing mainly to the terms of the Mitsubishi arbitration award, handed down in July 2010, which produced negative economic/financial effects amounting to 28.5 million euros. More specifically, consolidated shareholders’ equity decreased from 44.8 million euros at March 31, 2010 to the current 14.4 million euros, while net financial debt grew from 38.2 million euros in the first quarter of 2010 to 76.9 million euros in same period this year. Compared with the data at December 31, 2010, shareholders’ equity decreased by 6.6 million euros, due mainly to the loss for the period, and financial debt increased by 17.9 million euros, primarily as a result of changes in working capital. Somewhat surprisingly considering the shrinking away of much its income over the last year, Pininfarina has barely reduced its workforce between Q1 2010 and Q1 2011, dropping just 30 staff, natural wastage levels, to 826 employees in a year, meaning wages will remain a huge burden on finances. On April 11, Pininfarina S.p.A. entered into an agreement with a company of the Cecomp Group, Bolloré S.A. and Véhicules Electriques Pininfarina Bolloré S.A.S. (VEPB) involving the leasing of certain business operations until December 31, 2013. The business operations include the Bairo Canavese plant with its equipment, employment contracts for 57 employees, the existing provision for termination indemnities applicable to these employees and some contracts for the supply of utilities. Over the duration of the agreement, Pininfarina will receive a consideration of 14 million euros. On April 11, the Government’s Legal Services Office served notice on the Company that it was appealing to the Supreme Court of Cassation a decision by which a higher-level tax commission fully upheld the Company’s position in a dispute with the Internal Revenue Agency concerning VAT that started in 2006. On April 12, the Internal Revenue Police, acting further to a tax audit launched in June 2010, served the Company with a Tax Audit Report, the main issues of which concerned the agreements executed on December 31, 2008 by Pininfarina S.p.A., its shareholder Pincar S.p.A. (now Pincar S.r.l) and the Lender institutions to recapitalize the Company and the tax treatment of these agreements with regard to some indirect taxes. On April 27, 2011, Pininfarina S.p.A. sold to the Bolloré Group its interest in the 50-50 joint venture Véhicules Electriques Pininfarina Bolloré S.A.S. for a price of 10 million euros, which is substantially the same as the investment’s carrying amount. In the second quarter of 2011, this transaction will generate a gain of about 9 million euros in the consolidated income statement, consistent with projections for the 2011 reporting year. Finally Pininfarina's Q1 report in the section: Business Outlook for the Balance of 2011 and Assessment of the Group’s Viability as a Going Concern said: "No change occurred compared with the situation described in the Report of the Board of Directors on the 2010 annual financial statements, which should be consulted for additional information." In that report Pininfarina's directors said: "It seems reasonable to state that, over the medium term, the existing liquidity will be sufficient to secure the normal progress of the Group’s operations and the timely compliance with the financial obligations towards all of its stakeholders. However, at the end of 2011, the net financial positions is expected to show a deterioration of about 25 percent compared with 2010."